Shown with Optional 1st Diamond, Heart and Moon Charms. 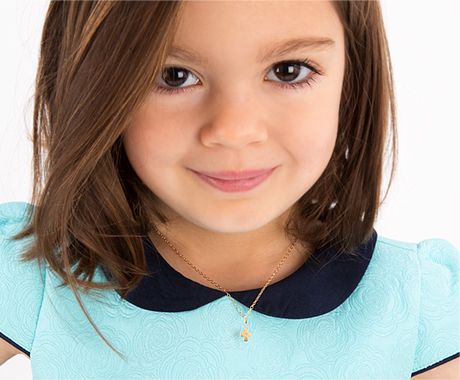 Safe high-quality materials, exceptional engraving craftsmanship, and a comfortable design makes this 14k gold bracelet essential for every child's budding jewelry collection. Purchased this item as a second birthday gift for a dear friend's daughter. Ordering was fast and easy, we received the product within 3 days of ordering. The bracelet was beautiful and packaged in a beautiful gift box. The name plate was somewhat smaller than I expected, but still looked wonderful on her tiny wrist. I love the little packaging the bracelets come in! So cute. The bracelets are gorgeous! I chose the genuine diamond heart and the diamonds are beautiful! I love them! Bought this for my nephew's 2nd birthday! The engraving is perfect. The font is perfect. Packaging and quality couldn't be any better. I wanted something more practical since Christmas just passed and my nephew has loads of toys. This is meaningful and will be used for several years. I always purchase from Tiny Blessings! I purchased two engraved 14K Gold bracelets for my 2 month old and 6 year old daughters. They arrived very quickly and were enclosed in a beautiful blue box wrapped in a satin white ribbon. The packaging also included a letter of authenticity, cleaning cloth, and a drawstring bag for storage. The engraving is beautiful! The chain is pretty thin but overall, I am very pleased with my purchase and my daughters love their new bracelet(s).